Our goal is to help our employees create their own successes by providing them every opportunity for them to thrive. We offer a healthy work-life balance, competitive wages and benefits, opportunities for personal and professional growth, a company contributed retirement savings plan recognition awards, corporate discount programs and much more! We are continuously seeking out the best and the brightest to become an integral part of a life-long opportunity and contribute to a vibrant future at our company. 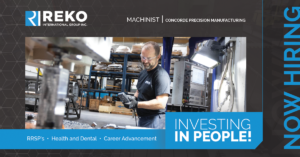 At Reko, we invest in our people and give them the tools they need to achieve success by offering apprenticeship programs, tuition reimbursement, and referral bonuses. We offer a family atmosphere at work and we offer many benefits to encourage our employees to have a family focused life outside of work as well. We offer flexible work schedules, paid and unpaid time off for personal time needed. We host family events and activities through the year and we offer a competitive benefit package for you and your family. 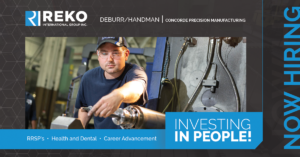 Reko is committed to offering a wide range of opportunities to our employees. As we continue to grow as a company, we want our employees to grow with us. By offering internal advancement opportunities and tuition reimbursement, we are able to build a strong team that fosters innovation and team work. 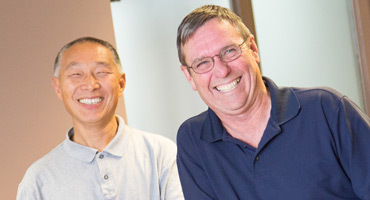 Empowering our employees is one of the keys to success at Reko. We strive to identify and implement ideas that will improve productivity, quality, probability, and safety. 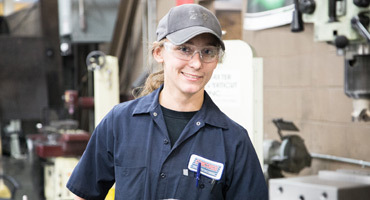 We encourage our employees to bring their ideas forward. Not only do we encourage it, we reward it as well. Our staff are willing to go the extra mile for us and we are willing to do the same.